Meg, Jo, Beth, and Amy March hanging out on their stoop. Little Women is a classic novel about four sisters finding themselves and their purpose in life during one of the most tumultuous times in American history. To celebrate the novel’s 150th anniversary, the story has been modernized to bring us a group of girls who might face new challenges in a different (but still tumultuous) world. Their sisterly bond is, of course, timeless. 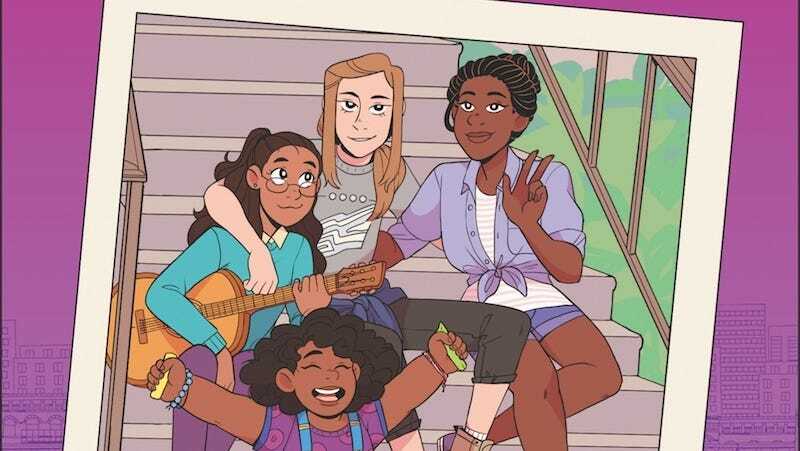 Little, Brown Books for Young Readers, along with Tapas Media, have announced the release of Meg, Jo, Beth, and Amy, a modern-day graphic novel adaptation of Louisa May Alcott’s Little Women. Written by Rey Terciero with art by Bre Indigo, the serial moves the March family from rural New England to Brooklyn, New York, and their adventures go with them. Clockwise from left: Amy the artist, Jo the writer, Beth the musician, and Meg the dreamer. According to the press release, their goal is to help new readers connect to the classic novel, much in the way 1995's Clueless did as an adaptation of Emma. The March family is now blended and multiracial, with Mrs. March working two jobs to support the family while their father is at war. Some of the novel’s original conflicts exist—like Beth facing massive health problems—but others have been reinterpreted. For example, Amy’s conflicts at school now stem from racism, and Jo is textually LGBTQ (as opposed to implicit in certain interpretations). “Jo is my favorite, so I wanted to play with the subtext that may not have been available 150 years ago, but that we can speak openly about these days. Being LGBT myself, I’m just happy to be creating a book that I wish I could have read as a young reader,” writer Rey Terciero said. Meg, Jo, Beth, and Amy debuts March 7, with a new “episode” arriving every week through October. There will also be a full paperback and digital release in November. Who&apos;s The Cleverest And Most Resourceful Young Adult Book Hero?